I just finished two books, both with a financial theme: The Price of Everything, a parable of economic emergent order, by Russell Roberts, and The Third Conversion, a "novelette" by R. Scott Rodin about fundraising as ministry and not just money. The first book is a very readable text that our seniors are reading in Economics; the second is a more semi-hokey series of conversations between a seasoned fundraiser and his up-and-coming protege. While recovering from my first kidney stone surgery, I found myself with some time to actually watch a few things on Netflix via the iPad. I'd heard of Joss Whedon's Firefly series (only one season of 15 episodes, capped off for resolution by the movie, Serenity) and enjoyed this "space western" well enough. I also had time for a few Shakespeare films (Kenneth Branaugh's Henry V and Patrick Stewart in Macbeth were excellent), which were fun and novel to watch. There's been a lot of "launching" going on this January. A week ago, City Pres got off the ground with our first official worship service (I helped serve the Lord's Supper) and our Tuesday night CityGroup started back up; this past week, we kicked off our Veritas capital campaign and website, which we hope will come to first fruition in early March; and I've enjoyed getting back in the classroom twice a week teaching the second semester of our senior American History course (two very different but engaging texts: A Patriot's History of the United States by Larry Schwiekart and Michaell Allen and A People's History of the United States by Howard Zinn). Other highlights so far this month: 70-degree weather, my four capitalist daughters selling three (and counting) enormous boxes worth of chocolate for their homeschool band program, Megan clearing off and cleaning my desk (she loves me), NFL football playoffs (which is really the only time I'm interested enough to watch), the daily newspaper in my driveway, cold milk on hand, and people who call me "friend". Okay. Guess it's time to deal with email, to which I say (in my best British accent): "Do your worst!" Thanks for reading. Never mind the fact that it’s my favorite U2 song and the single greatest performance in the history of SuperBowl half-time shows, but I remember how healing and powerful U2’s 9/11 tribute was in February of 2002. Even watching it now, I’m blown away by the visual of bright hope emerging from the dark background of tragedy. Maybe this (among other reasons) is why, ten years later, my sense of grief is not as personally paralyzing as it seems for others. Some may roll their eyes, but in reflecting back, I think Bono and the boys helped me deal with it then…not completely unaffectedly I’m sure, but in a way that allowed me to move on. "Here we are now…entertain us"
So Megan and I, having been the victim one too many times of AT+T raising our home phone/DSL rates again, have re-entered the fray of trying to figure out the best communications deal out there. If you've done this recently, you know it isn't easy: there are far too many options, and none of them seem all that great bundled together for our particular purposes. Our particular purposes, I suppose, are part of the problem, but so are the prices. In researching options, I was amazed both at the breadth of what's available as well as what the market is apparently willing to bear per month to subscribe to them. By my estimation, families with a land line, multiple cell phones (say 3-4), 300+ TV channels with multi-channel DVR capabilities, and broadband Internet across multiple computers could be paying as much as $400-$500 per month in fees, which doesn't even include hardware (cell phones, receiving dish or cable installation, computers) costs on the front end. We currently have a land line, one pay-by-the-minute cell phone ($100 goes about 6 months), antenna television (6 channels), a mid-level (two movies out at a time) NetFlix subscription, and DSL. Add on a subscription to Covenant Eyes for the computers and we now pay about $120 in monthly fees, which we've determined is too much for our budget. We'd like to find a cheaper land line provider (or drop the land line altogether and bite the bullet financially and philosophically by going to two cell phones), but we can't make the numbers work (and, of course, none of this even deals with the whole television part of the equation, nor the movie rental fee). How much is too much in this area of communications? And is it really "communications" being talked about, or is our culture's thirst for entertainment – visual, digital, social – behind the willingness to pay ever-increasing amounts of money to ensure access to it? For the Christian, how does what gets spent on entertainment compare to what gets given to the Kingdom each month? How much is too much/too little? Where's the line and what are the reasons for where it's been drawn (or re-drawn) over the years? Wrestling through this anew these days. Feel free to add your two cents and share your own communications/entertainment experiences, ideas, and counsel. I'm open like 7-11. School: This week is finals week, so I'll be spending most of my time grading. The good news is, unlike the past three years when I was evaluating projects and papers, I'm going into finals week with nothing other than finals to grade, so that should make for a little less consuming week in general. In other school news, I've signed on for another year at Westminster, but my role is changing a bit as I'll be leaving the world of freshmen New Testament behind for fourth section of sophomore Ethics and one section of senior Worldviews next year. I'm glad for the transition all around. One last note on the school front (this time the homeschool front), we're going to be entering a new stage of education here at home. This fall, our two oldest girls will be full-time students at Central Christian School in Clayton, while Megan continues leading the Classical Conversations group and homeschools our younger two (here are details from Megan's perspective). Summer: In addition to writing (more on that below), my primary goal in June is to hang out with the little ladies, read some books, and get a few projects done around here. In addition, I'll help coach our Westminster summer baseball team for a week in June, as well as get trained on some new school information software, as I've been asked to be a mentor teacher to the rest of the staff this fall. July ups the ante considerably in terms of travel, as we're planning a family trip to Colorado Springs, as the girls are now old enough (somehow) to attend The Navigators' camping programs (Eagle Lake and Eagle's Nest) we helped lead back in the day. I'll try to see as many folks as I can in a few days' time before I jump on a plane from Denver to Portland for my third year as part of Westminster's Summer Seminar. This time, I'll be investing ten days with 25 soon-to-be seniors in Washington state instead of South Dakota, after which I'll fly back to Colorado and then we'll all drive back to Missouri. Worldviews class. Orientation starts the 12th and the first day of class is the 16th. Studying: Despite baseball high-jacking my time and energy, I've been reading in a couple areas of interest this spring, not the least of which has been the study of the end times, or eschatology. N.T. Wright's book, Surprised by Hope: Rethinking Heaven, the Resurrection, and the Mission of the Church, has been helpful, as has revisiting my notes from seminary (particularly Dr. Dan Doriani's notes from his Epistles and Revelation class). Of the three years I've taught Revelation to my freshmen New Testament classes, I feel like I've done the best job this year. I'm also finishing up a couple books on education, namely John Dewey and the Decline of American Education by Henry T. Edmondson III, Curriculum 21 edited by Heidi Hayes-Jacobs, and The Secret of TSL by William Ouchi. It seems I've been reading these for a while (and I have), but there's been some good content that's come as a result. Looking ahead, I have some Worldviews reading to do this summer, including (Re)Thinking Worldview by J. Mark Bertrand; The Compact Guide to World Religions edited by Dean C. Halverson (ed. ); The Journey by Peter Kreeft; Total Truth by Nancy Pearcey; and The Universe Next Door by James W. Sire. Should be fun. Writing: Now that my second book, Learning Education: Essays & Ideas from My First Three Years of Teaching, is finished, I'm turning back to finishing the ThirtySomewhere manuscript this summer. I'm still looking for a formal publisher to get behind it, but now that I've experimented with the self-publishing gig a bit (and am still experimenting), I may go with what I've got at some point this fall and see what happens. We'll see. I plan to continue blogging here, though I really wonder how much people are interested in anything longer than 140 Twitter characters these days. Speaking of which, I've enjoyed Twitter enough to keep using it, but there again I just have no way of really knowing how far the medium's actual reach is so as to invest more time in it. Oh well. Guess that's it for now. There's more, but this is long enough. I'll try to post a few more thoughts later on this week (nothing brings out literary creativity like the desire to avoid grading). Have a good one. A friend of mine in Colorado is in a fun but fierce battle with a Canadian friend of his over the outcome of the Olympic gold medal hockey game in which Canada beat the U.S. My friend asked me to write a parody of the Canadian national anthem to use as ammo. True luck that we have Captain Kirk's command. O Canada, we raise remotes to you. God keep us warm, laid back and free. O Canada, we love to watch TV. On Friday night, for old time's sake, Megan and I rented The X-Files: I Want to Believe, the second of two movies based on our all-time favorite television show that ran from 1993-2001 (we have all nine seasons on DVD). Being the X-Philes that we were/are, we caught the midnight show of the movie on the night it came out last July (I wanted both of us to dress up like FBI agents but Megan thought we might be the only dweebs in attendance, which was far from the case), but were disappointed by creator Chris Carter's decision not to develop the government conspiracy story arc that was so key to the weekly episodes and the first movie in 1998. The second movie worked well enough as a monster-of-the-week episode, but that was about it; I didn't even write a review. Still (and in light of discussion on my recent LOST post), watching the movie a second time last night, I found that it played better than I remembered on the big screen, mostly because of the depth of characters Fox Mulder (played by David Duchovny) and Dana Scully (played by Gillian Anderson). Even without the government conspiracy arc, the personal transitions the characters had made over the nine seasons were still there and went beyond "type" to believable humanity. Granted, the direction wasn't as strong and the plot was plenty morbid (think Frankenstein meets organ trafficking), but the humanity of the lead characters really stood out, which made it that much more watchable. So, if anybody's looking for a new DVD fetish with real characters that actually change and grow over time, let me recommend The X-Files. The stories are well-written, the science is fascinating, and the tension of the modern world trying to make sense of what cannot always be made sense of is a healthy one. 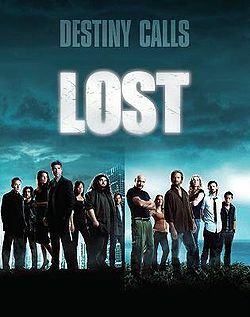 I can't believe I'm writing a post about the Lost premiere last night, but here goes. We came to the Lost hysteria late, watching a majority of the seasons on DVD this past summer, and finishing up season four over Christmas break. I just about bailed in the middle of season three (it was like watching paint dry), but season four redeemed things for me as the plot actually began moving somewhere. That said, I'm semi-bored with the characters and much more interested in the island itself – its history, its abilities, its significance. I've read theories of what the island represents (purgatory, etc. ), but I doubt it's that simple (though I don't think it's altogether non-spiritual in meaning either); I'd just rather spend more time on the Dharma Initiative and the island's supposed metaphysical characteristics than watch Kate cry (again). For me, the most interesting scene of the whole series has been the brief confrontation in season four between Benjamin Linus and Charles Widmore. While one could interpret Widmore's claim to past ownership of the island merely as proprietary, it seemed a loaded statement, almost hinting at some larger cosmic "ownership" normally associated with deity. Not sure where to go with this (it can't be a good vs. evil thing between the two – who is which? ), but I'm holding onto that scene as a key to the resolution of the story. Overall, I give the premiere a B- for the evening – not bad by any means – but the human characters are getting in the way of the show's real star: the island. Thanksgiving is easily my favorite holiday, but the break always feels so short. The good news is, because Thanksgiving was so late this year, I only have two weeks of teaching and a week of finals before two weeks of Christmas break. Enjoy the rest of your holiday weekend, everyone. Powerful episode of 24 Sunday night. “Redemption” caught us up with illegal expatriate Jack Bauer (played by Keifer Sutherland) coming to the aid of African children kidnapped to be made into child soldiers under a would-be dictator. As always, the show’s story was straight out of news headlines, even including a presidential transfer of power in Washington, with the only major detail missed being the casting of the new President as a woman instead of a black man (apologies to both Senators Clinton and Obama). In a word, the episode was heartbreaking, as the use of thousands of child soldiers is going on in at least 17 different countries today. For the past two years, Westminster has been involved with an organization called Invisible Children, whose Schools for Schools initiative exists “to creatively raise money for the schools of northern Uganda, improving the quality of education for war-affected students.” So far this fall, the WCA student body has raised over $15,000 (mostly in spare change) to help the same secondary school in Gulu that we helped last year, ranking us first in the country of all participating U.S. schools with less than a month to go of the 100-day window. While I’m not a big fan of the competitive giving strategy utilized by the organization (and enabled by Westminster), I was glad that one WCA student, as well as my friend and teaching colleague, Ann Heyse, “won” the opportunity to represent our school in Gulu this past summer. Ann spent six weeks with Invisible Children, training teachers and teaching students with her expertise in English, and based on both her personal testimony and her excellently-written blog documenting her experience, it seems the organization does good work in a place that needs much good work done. Last night, as I watched the two-hour teaser that creatively gets Jack Bauer back to the United States for the show’s seventh full season beginning in January, I found myself overwhelmed by the realism of it all…that is until one particular commercial break when there was a quick screen shot for the Human Rights Watch website, followed immediately by a national Pizza Hut commercial, and then a local ad for St. Louis’ very own Casino Queen (“home of the loosest slots”). Whew. Assuagement by advertising. What an incredibly confusing postmodern culture we have created, one in which almost every aspect of life is separated from any true and meaningful meta-narrative. How strange to go from African children dying to ordering two-for-one pizzas to having a great time gambling, all in the course of 60 seconds. And yet for those of us who have been breathing this postmodern air our entire lives, the progression doesn’t seem strange at all; it is exactly what we have come to expect (at least, that is, before God’s revelatory red pill of the gospel allows us to see power, gluttony, and greed for what they really are). We live in a broken world, friends. Whether in Africa or America, ours is both a needy place and time to be alive, and not even Jack Bauer can get us out of this one. A thought crossed my mind this week that I’ll throw out to see if it sticks. For many of you, this may fall in the “I could care less” category, but since I spend a majority of my time with teenagers, I’m interested. It seems to me there’s a major generational shift going on in the teen entertainment business. For instance, earlier this week, the MTV show TRL (Total Request Live) took a final bow after ten years of attracting the “biggest and hottest recording artists, actors and celebrities on most weekday afternoons,” all while playing “the most iconic videos of the day.” For better or for worse, a majority of the boy bands, pop tarts, and rappers of the past ten years got a whole lot of promotion via TRL, a fact wonderfully and cynically documented in the 2001 movie (not the 70s TV show) Josie and the Pussycats, one of my favorite commentaries on the youth culture of the time. Finally, I don’t know if anyone’s seen the trailer for J.J. Abrams‘ new Star Trek movie, but there’s nary a recognizable face among the actors playing the new (and young – very young) versions of Kirk, Spock, Scotty, et. al. Granted, Abrams’ name is the draw (he of Alias and Lost fame), but with him at the helm, it’s interesting there isn’t more familiar young “star power” (notice I didn’t say “talent”) attached. Is something going on here? Anyone have any thoughts, or am I just spending too much time with high schoolers? My interest is not in the fact that I’m getting older (I know that already), but in the fact that the youth culture of recent years seems to be. In the comments on my last post, the discussion took a turn and ended up on The X-Files and the upcoming second movie, due out July 25th. I'm geared up for the flick, though I have no idea why they're apparently letting go of the government conspiracy arc and dealing only with the paranormal; still, as long as Mulder and Scully are back, count me in (we own every season on DVD, and watched one episode a night last year to reconnect with our TV counterparts). Back in the glory days of The X-Files, I had an idea for an episode in which Mulder and Scully were chosen to participate in and test the ultimate Witness Protection Program. The gimmick? Those in the program were unaware of their involvement in it, thanks to a combination of drugs, relocation, and cover-up. It could have been a cool idea, but later that same season, there was an episode in which Mulder and Scully went undercover as a married couple, so my screenplay would have seemed redundant after that. TAG LINE: "THE TRUTH IS OUT THERE"
Jon Stewart is brilliant. Watch this short interview with Chris Matthews about Matthews’ new book, Life’s a Campaign, and marvel at how quick (and right) Stewart is (hat tip: Jon Barlow). My friend, Travis, has a good (but too short) post on both his disgust at the shootings at Virginia Tech and the media’s Pavlovian dog-like pantings in covering it all, live and on location. My own impression was similiar to Travis’ – when I finally got home Monday evening and turned on the news, I found myself actually talking back to Brian Williams on NBC, begging him to stop posing for the camera and over-dramatizing his lines while he interviewed students who had almost lost their lives in the horror of the day. I’ve since limited my following of the story to the Internet (though part of ABC’s “special” with Diane Sawyer – complete with cross-fading pictures of victims set to slow, dreary music – almost snuck in before my nightly X-File last night). Reporting the news has sure gone beyond reporting the news; it’s all about “tragedy capturing” now. “The information, the content, or, if you will, the ‘stuff’ that makes up what is called ‘the news of the day’ did not exist – could not exist – in a world that lacked the media to give it expression. I do not mean that things like fires, wars, murders, and love affairs did not, ever and always, happen in places all over the world. I mean that lacking a technology to advertise them, people could not attend to them, could not include them in their daily business. Such information simply could not exist as part of the content of culture. Or, to make the point more crassly (but succinctly), don’t forget this Don Henly ditty from 1982. Which is a poorer commentary on human nature: the VT murders or our fascination with them? I won’t go into all the minute-by-minute details of the last two nights (you can get them all – literally – here), but I will say I’m struck by both the uncomfortable reality of its vivid portrayal of terrorism, as well as its powerful illustration of Islamic discipleship in the world today. Sure, Hollywood takes a few liberties (terrorists never looked so handsome, in a GQ kind of way), but a peek at the commitment and community of a guy who’s getting ready to blow up a bus or a bomb along with himself in the name of Allah is, well, gripping. While we in America may call such an act cowardly in terms of traditional warfare (and it is), we can’t deny the extent to which these followers are willing to live out their convictions either. It’s the difference in a plate of ham and eggs: the chicken was involved; the pig was committed. In my Old Testament Prophets class this past weekend, Dr. Richard Pratt asked if anybody knew of the existence of a Covenant Seminary martyr list? There were a few smirks and uncomfortable glances, but somehow that was one document that hadn’t shown up in the promotional materials. Dr. Pratt was dead serious about the question, however, going on to make the point that, in a world in which more Christians are being martyred for their faith than at any other time in history (first century included), how is it that very few of us in the PCA or the larger American evangelical church know any one who has been martyred for his or her faith? Fewer smirks; more uncomfortable glances. Come on, Pratt…just teach the Bible. Tertullian wrote that “The blood of the martyrs is the seed of the Church.” And, while I suppose it’s a morbid convergence of my January-term class schedule and my recent television habits, you don’t have to be Jack Bauer to figure out the connection between the persecution of the Kingdom and the accompanying growth of it, both historically as well as present day. Which kingdom am I really committed to build? God’s? America’s? Mine? Perhaps more telling: how far am I willing – really willing – to go to build it? How far have I gone so far? How willing is Megan? Our family? This, I suppose, is the hard one for me. When I was single, I really did have more of the martyr mentality than I do now. Obviously, being a husband and father changes you, but, as Dr. Pratt challenged us, our grandfathers went to fight in World War II because of their love for our parents, not in spite of it. It’s not that God is asking us to take up arms against Muslims (or anyone else); his is not the call to a 21-century version of The Crusades (one of the worst human ideas in the name of the Church, bar none). But we are called to give our lives for the sake of the One who gave his life for us – not to blow people up, but to risk reaching those who would us. In many regards, Jack Bauer’s job is easier than mine: he can kill anyone who attacks him and his citizenship; I’m to love my attacker and give my life for mine. We don't get CBS, but that's not as big a deal as not getting FOX, at least for the premiere of 24 in ten days, as well as the baseball play-offs later in the year. I suppose the nice thing about our limitation is that one quick flip through the channels is usually all it takes to decide there's probably a book somewhere in the house worth reading. Tonight, however, as I was doing my customary 30-second flip before heading for my reading chair, I happened upon a preview for TBN's new show called GIFTED, a blatant American Idol rip-off featuring overly-giddy, "I can do all things through Christ who strengthens me"-quoting teenagers and twenty-somethings anxious for their big break in the Christian music biz. "16,000 contestants. 8 finalists. 3 judges. 1 winner. GIFTED. On February 2nd in prime-time television, the first season of Gifted will be televised to over 49 million households on TBN (95 million total U.S. reach) This 2-hour show hosted by Brian Littrell (Backstreet Boys) will showcase 8 finalists singing some of the most well-known songs in Christian Music in styles ranging from Praise & Worship, Gospel, and CCM with the winner receiving a recording contract with EMI Christian Music Group. The winner of GIFTED will also receive management by the Wright Entertainment Group and day-to-day support from Wright Gener8Xion Entertainment. The winner will have the opportunity to make an immediate impact with an invitation to open for Brian Littrell on the road. Additionally, a $10,000 donation will be made to the church where the winner originally auditioned." The judges for this extravaganza are EMI publishing president, Eddie DeGarmo; pastor and artist, Andrae Crouch; and former lead singer of Stryper, Michael Sweet, who, judging from the preview, is probably going to play the truth-telling role of Simon Cowell, letting kids know in no uncertain terms (but in the name of Jesus, of course) that they really can't sing. I suppose it was only a matter of time before something like this came about (actually, the Christian sub-culture was a bit slow following American Idol's immense success – the mimicry normally takes about two years). Regardless, this is just one more reason for people not to take the things of God seriously (if you need more than one reason, be sure to check out the remainder of TBN's programming schedule).